silicone might help from stopping is unwind and is easy too clean off. or what about if you add another ring on top too lock it? I emailed them about the damage I've caused asking for a new spanner and rings. He wants some photos. I am thinking if I get another set of rings ill keep the old set on top to make it lock. So I'm doing my install now, what did everyone end up doing about the counter weight, just leaving it off? I left them attached to the stock struts. I don't think there is a way to mount them on the new coilovers. I'm still on the factory struts, and I removed those anchors. can i ask where are these made in? All of MeisterR engineering are done in house at our UK workshop located in Rayne, Essex. The ZetaCRD are assembled in Taiwan. The Locking collar used is MeisterR unique RANS design, and it is currently under UK patent pending status. We do run spot check of all MeisterR products in UK to ensure product quality control are kept consistent to MeisterR quality. The ZetaCRD are designed for fast road & occasional track use. The damper specification are match to the paired springs rate, so performance are ensured as full stiff damping setting are closely match to the 100% critical damping force of the setup. What that mean is the suspension are designed to provide maximized performance as a complete package out of the box. For those looking for more advanced suspension, we also offer the GT1 coilovers. 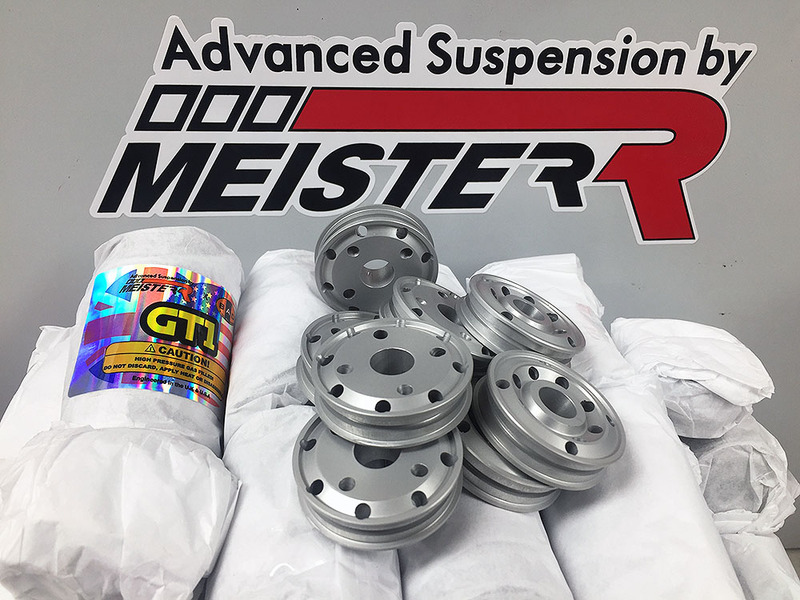 The GT1 coilovers are assembled in UK or USA using MeisterR unique SDV (Staggered Digressive Piston) and other internals. The SDV piston and all other internal parts of the GT1 are CNC in house at our UK workshop. Each GT1 are hand build to specification for each specific customer, so specification will vary depending on the focus of the customers. I hope that helps, any other questions just let me know. Installed this yesterday and Im loving it. I set it to it's softest setting after trying the factory setting (-8 from hardest, way too stiff for my liking), and then went on test drives around my neighborhood to start dialing it in. I ended up at +8 from softest front and +2 from softest rear. It feels very supple over uneven surfaces, it's more comfortable than stock (I came from swift springs and stock dampers), and I can also feel the weight transfer a lot more; lift off oversteer feels more controllable and more traction everywhere else when you don't want it sliding. The handling just seems more playful now; it almost feels like a more expensive car. Very impressed with the design and the overall quality. 0 preload was set out of the box. Fast shipping too! anyone rubbing with 215/45/17s on meisterR coils? MeisterR coilovers for Fiesta ST, what do you use your suspension for?